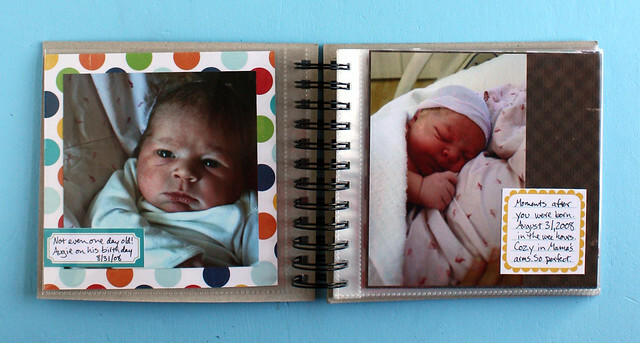 When my older son, Wyatt, was a baby, I was at the height of my scrapbooking obsession. I created page after page after page about him and as a result I have 3 huge albums stuffed with photos and stories about his baby and toddler years. 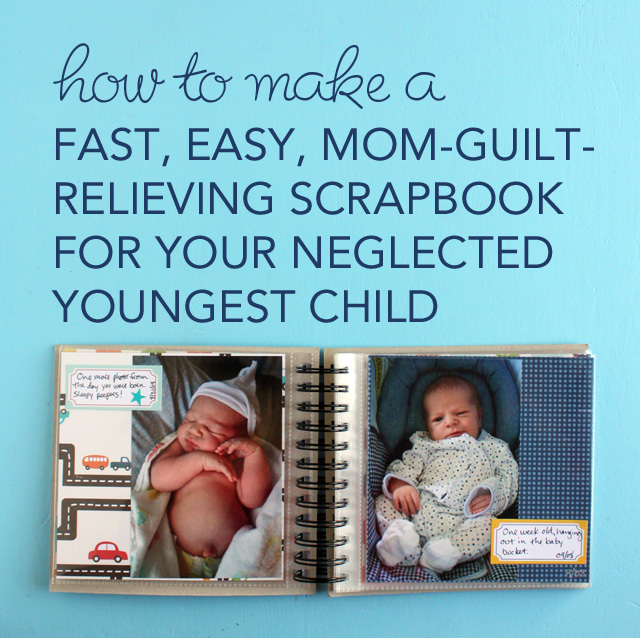 But when my younger son, Augie, was born the time I had available for scrapbooking evaporated almost immediately. 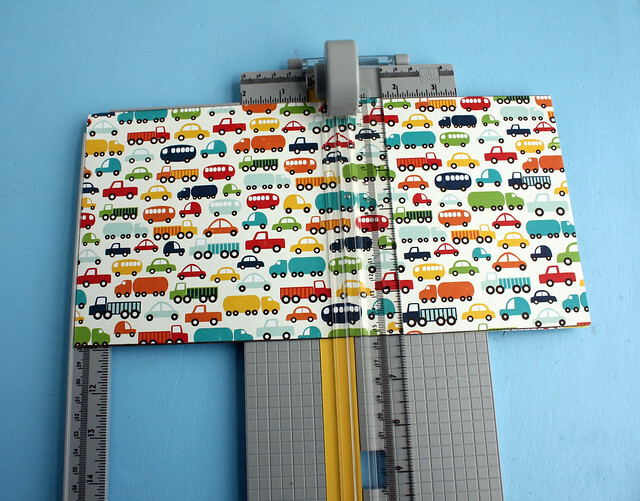 I still have the scrapbooking love, but the time? Er…not so much. Poor old Augie. While Wyatt has hundreds of scrapbook layouts, my beloved and just-as-photographed younger child has a mere 14 pages devoted exclusively to him. Lately he has been asking to see his scrapbook pages a lot and he’s started to notice the discrepancy in the number of stories I’ve written down about him versus the number we have about Wyatt. And I’ve started to notice a crushing mom-guilt descending on me as a result. 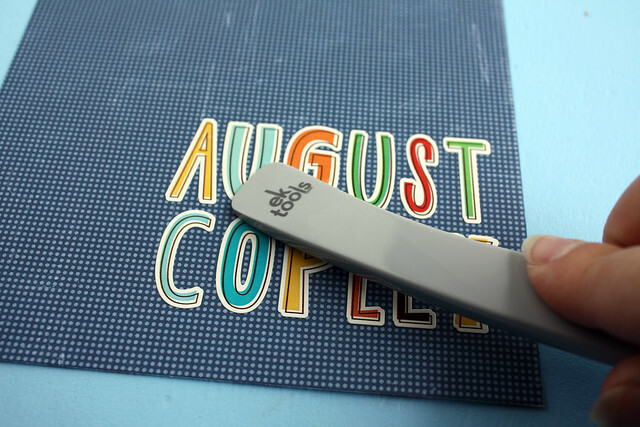 When a big box of EKSuccess Tools for paper crafting arrived on my doorstep last month, I immediately knew that I was going to use them to make my little Augie an album. I was going for something fast and easy that would allow me to get a lot of pages into an album quickly and I knew these tools were just the thing to make that happen. The EKSuccess team sent me a huge assortment of tools to play with. 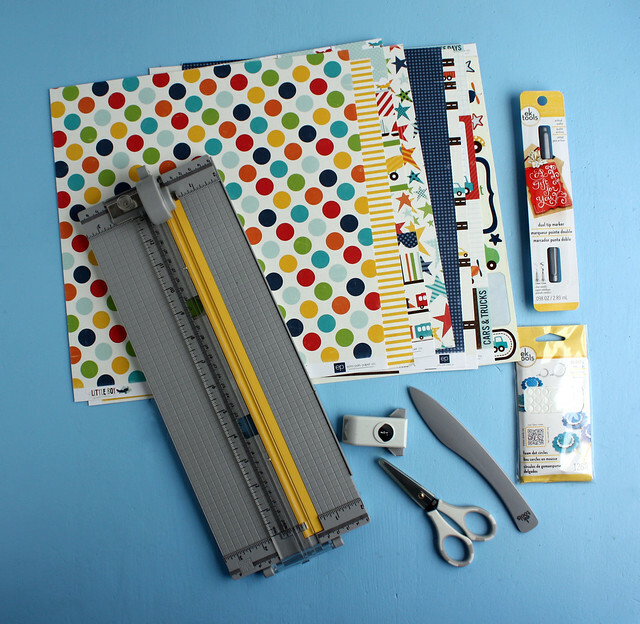 My absolute favorite item is a rockin’ rotary cutter that I immediately fell in love with. It has lots of little features that make precise cuts easy, along with safety features that help keep little hands safe. 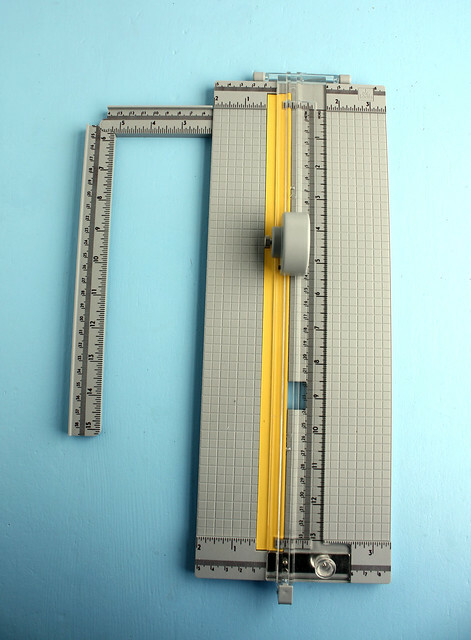 (My old paper cutter has now been retired in favor of this new one — it’s that good.) 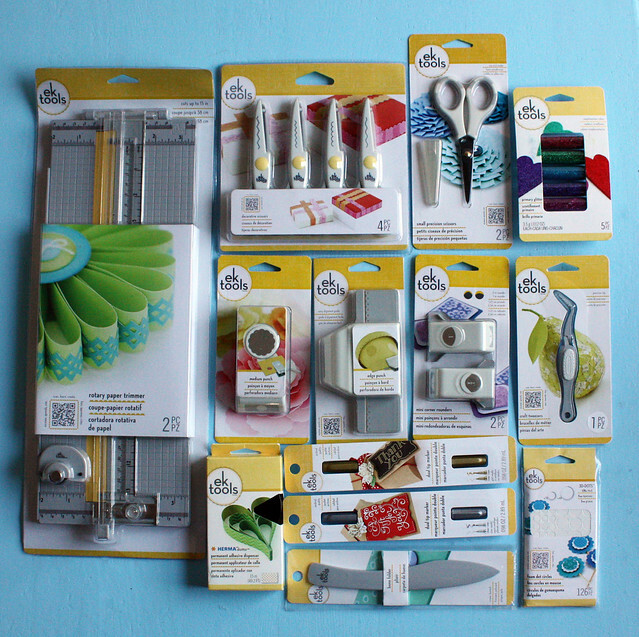 There were also an assortment of scissors, adhesives, pens, tweezers, glitter and several slim-line punches. My new bounty tempted me to get fancy, but in the end I decided a simple approach to this book was best because I wanted to get it done. 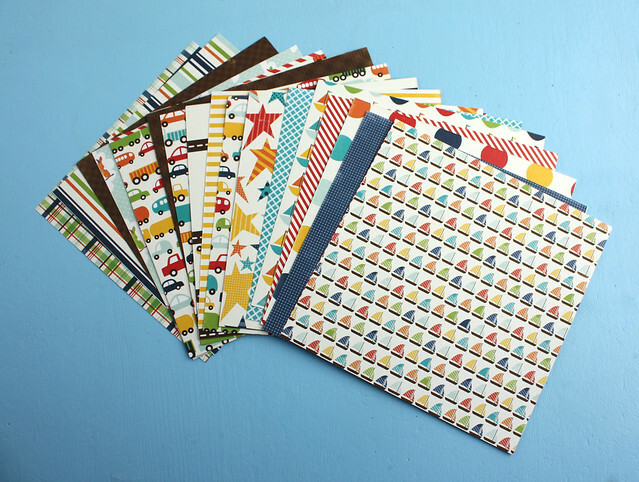 Next, I cut the scrapbook paper into 20 6 x 6 inch sheets (the number of pages in my album). I specifically chose paper that had patterns on both sides to save time. The EKSuccess rotary trimmer makes quick work of this cutting because it has a swing arm ruler on the side that can be bent at the 6 inch point. 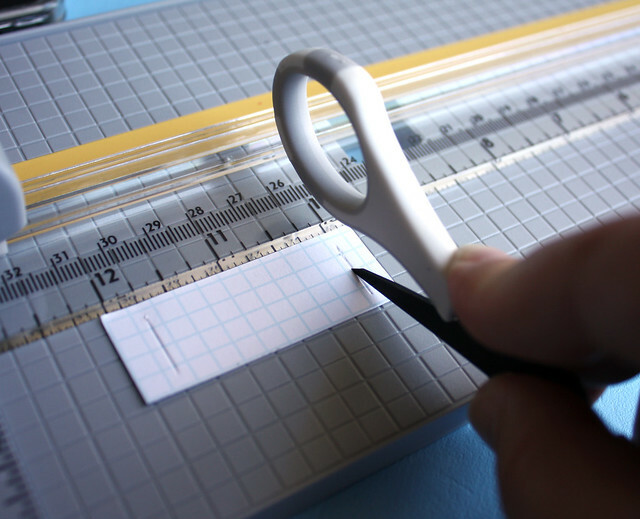 Just slap a sheet of 12 x 12 inch paper up against the part of the guide bar that’s bent down, slice it with the rotary cutter and in a matter of minutes you’ve got yourself a big pile of 6 x 6 inch paper sheets. The paper pack I used also came with a sheet of small journaling blocks. These also needed to be cut and again the rotary cutter made quick work of this part of the project. Usually I use a cutting mat, ruler and craft knife for this sort of thing because cutting right on the lines between the different sections can be a bit fussy, but I was able to line the paper up on the cutting guide of the rotary cutter (see the dark line on the yellow strip in the photo above?) to get precise cuts. Suh-weet! 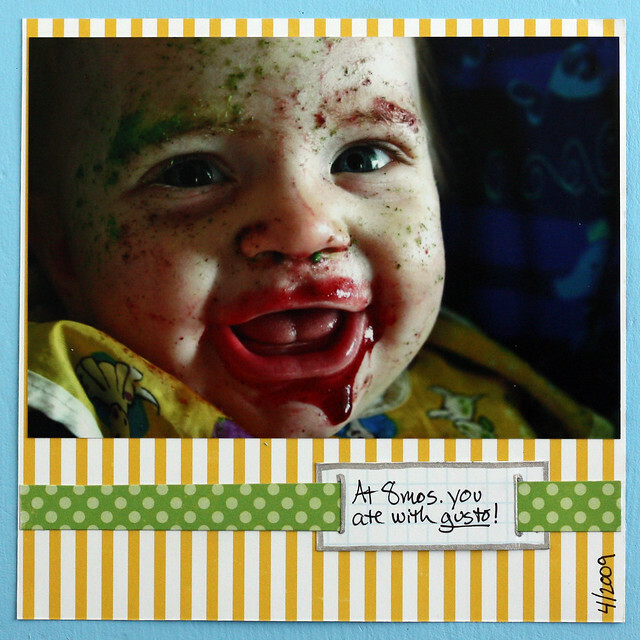 I taped the photo of Super Messy Baby to the square of paper using the double-sided tape. Next I took a rectangle of paper that was about 2 inches long and 3/4 inch tall and I scored either end of it on the base of the rotary cutter using the bone folder. The grooves in the cutter base helped to guide the bone folder and kept the lines straight. 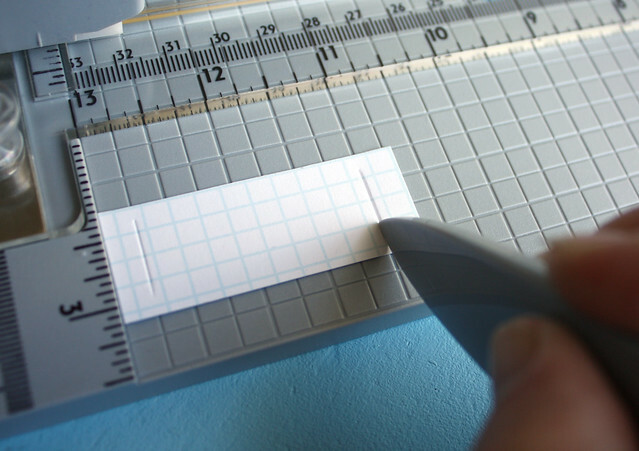 Using the grooves I’d marked as a guide, I then opened the precision tip scissors and used them like a knife to cut slits in both ends of the paper. This was faster than digging out a craft knife and the scissors are super sharp so this worked really well. 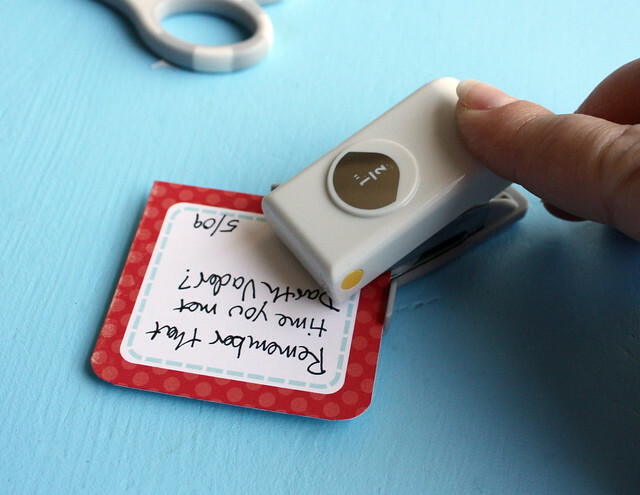 Finally I outlined the little tag I’d made with the fat end of the silver pen, wrote a caption for the photo and slid the tag onto a 1/2 inch wide strip of paper. Then I taped the whole shebang on the page. Here’s another example of one of the pages in the album. 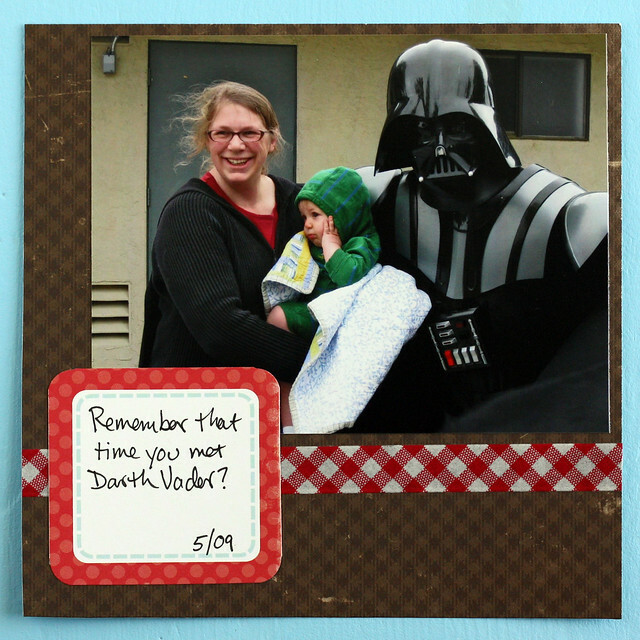 This one features a photo of Augie and I hanging out with Darth Vader at a birthday party. 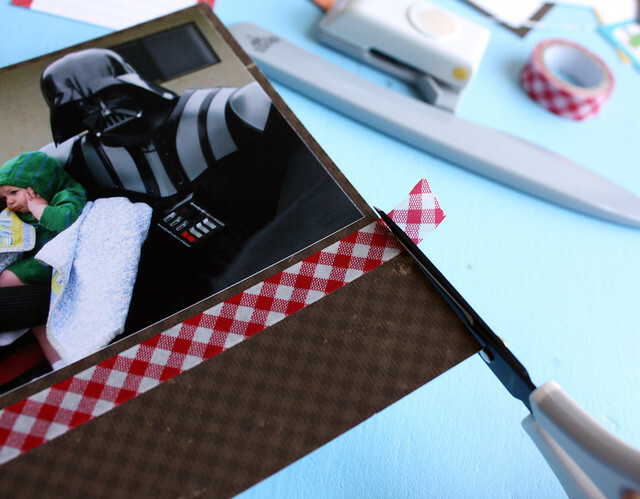 I stretched a piece of washi tape under the photo, then trimmed the ends with the precision tip scissors so they were flush with the edge of the page. (The scissors are non-stick so you don’t have to worry about gumming them up with the tape). 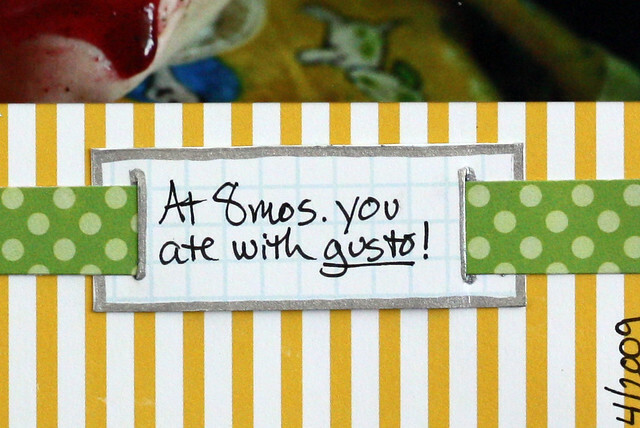 Next I wrote a quick caption on a tag, rounded its corners with the corner punch and centered it over the washi tape. All of the rest of the pages in the album are basically the same — a photo, a caption on a tag and sometimes a strip of paper or an added sticker. I wanted this to come together quickly and to really let the photos shine. The only page that’s any different is the title page and even that is simple. 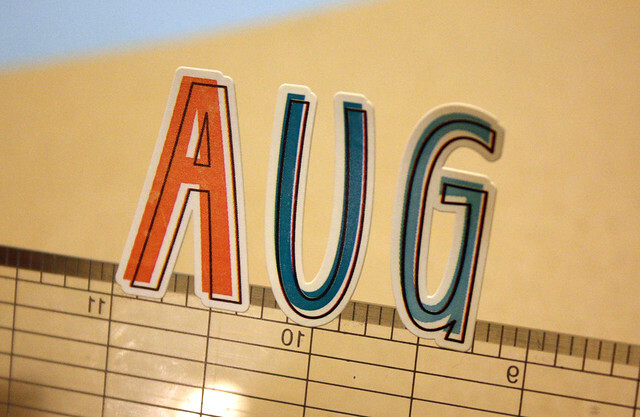 I used colorful letter stickers to spell out Augie’s name and left it at that. I’m pretty fussy about my letter stickers and I hate for them to be crooked or unevenly spaced. One trick I use to keep them straight is to line them up on the edge of a ruler. 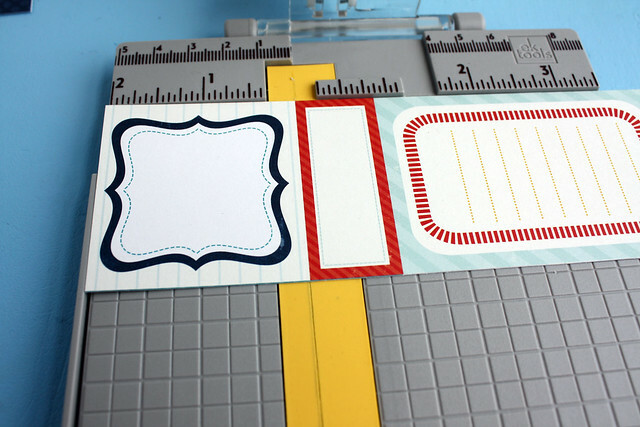 I use the markings on the ruler to make sure the bottom edges of the stickers are evenly aligned, then I lay the ruler over the paper and move it around until I figure out exactly where I want the word to go. Once I have it placed properly, I press the top parts of the stickers down and slide the ruler out from under them. After I put the stickers on the page, I gently run a bone folder over them to make sure they’re smooth and firmly attached. And that’s pretty much it! One morning of scrapbooking and I have 40 pages of photos for Augie to flip through. We’ve already gone through it a number of times together and he’s also enjoying carrying it around with him and asking me questions about the photos. And I have 25% less guilt about the scrapbook inequality that exists in our family! Phwew! I wrote this post as part of a paid campaign with EKSuccess Tools and Blueprint Social. The opinions in this post are my own, as is the adorable baby in the pictures.